Native Instruments - Pop Drums это премиум-класса акустические комплекты барабанов для использования в Поп музыке. 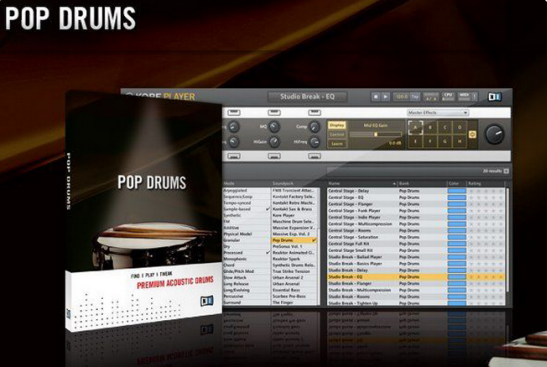 Native Instruments POP DRUMS - powered by Kore Instruments, offers two brand new premium acoustic drum kits ready for your Pop production. Each kit was carefully recorded to give the full dynamics of a real acoustic drum set. Fully using engine KONTAKT, integrated into KORE 2 and KORE 2 PLAYER, this pack contains 20 KoreSounds, covering the full acoustic kits, a smaller version of the 'rapid intervention', and a selection of sounds using the built-in effects KORE. Additionally, Native Instruments POP DRUMS, used with KORE 2 and KORE 2 PLAYER, include numerous sound changes and a selection of MIDI grooves for a wide range of production styles.